Monson Library Up and Running Again! Here is a podcast from Mur Lafferty, an old mailing list associate of mine (back in the day when the Web was new and listservs were the forums of old). She has gone on to move forth some very successful personal projects. She talks at length and brings up some very cogent points on the subjects in this debate. The whole podcast is awesome so enjoy listening to it. It also brings up the Kindle vs. Book debate. Tracy Hickman brings up some great points on the subject. Personally my view on this debate is that both avenues to get books to the public will continue to exist. As much as the camps are becoming as divided as the right and the left in politics this energy is needed. There is a new dynamic to the world of writing and publishing. I think it is healthy. It brings writers who may never have known success to the attention of readers. Yes, the traditional circles hate the upstarts much like the nouveau riche were hated during the industrial revolution. Honestly they need to get over themselves. Publishers will always have the professional veneer and economics of scale to make them successful. They will always have that advantage. Most writers, no matter how personally successful, will still want the shiny badge that comes with being published. My latest library excursion brought me to the Hubbard Memorial Library in Ludlow. Please note that this library is not just The Ludlow Public Library. This library was named after someone. It is easy to see the building as just a library and not even think of its actual name. I believe that it would be safe to say that if I were to ask the average resident of Ludlow who this Mr. Hubbard was I would not get much of a response. Perhaps someone would say, as a mild aside 'some rich white guy'. I'm not going to rail against the lack of knowledge of local civic history. It is simply a sad fact of life. Many people who sought to foster the community and contribute to the community (and were successful) are oftentimes forgotten by those they serve. It is an irony that their push to move the community forward left them in a dusty anonymity. I'm not saying that that it is intentional, but it is rather a symptom of a changing society. The world is getting smaller and people are looking outward at the world. In the past communities were more tightly knit because getting the news and communicating was not easy. Then in relatively rapid succession came the radio, television and internet. At one time the local community was all there was to see, now instant information is available on local events across the globe in the remotest areas. In all this poor Mr. Hubbard gets lost in the wash of information. Who was Mr. Hubbard, you ask? Why, he was a rich, white guy. He also cared very much for the progress of the Town of Ludlow. 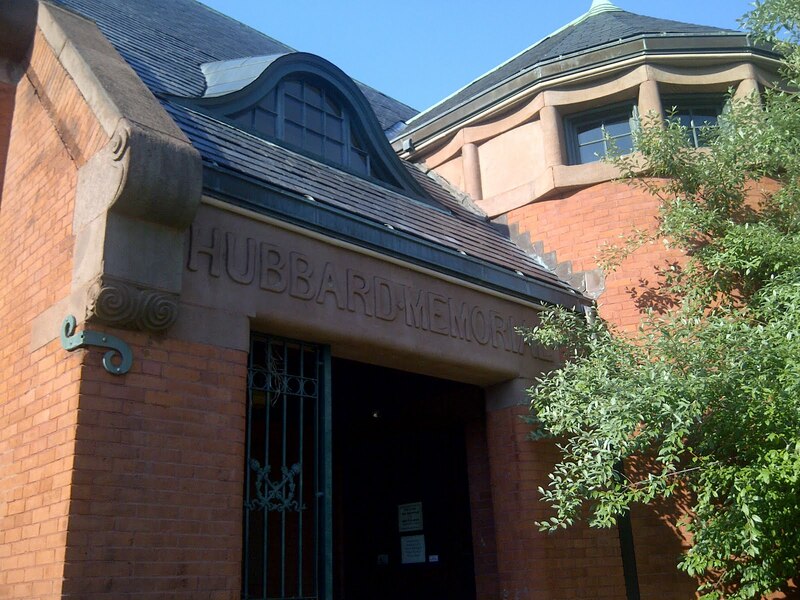 As founder of the Ludlow Manufacturing Company, Charles Townsend Hubbard was in the position to not only employ a great many people, but also set up a reading room for their use. After his death in 1887 his family donated a building owned by the company to the town for the establishment of a permanent library. The original reading room was located in the "Old Tavern House" (That just has such a wonderfully colonial ring to it!) not too far from the donated building. For more information on Ludlow history you can read (thanks to your friends at Google) The History of Ludlow. 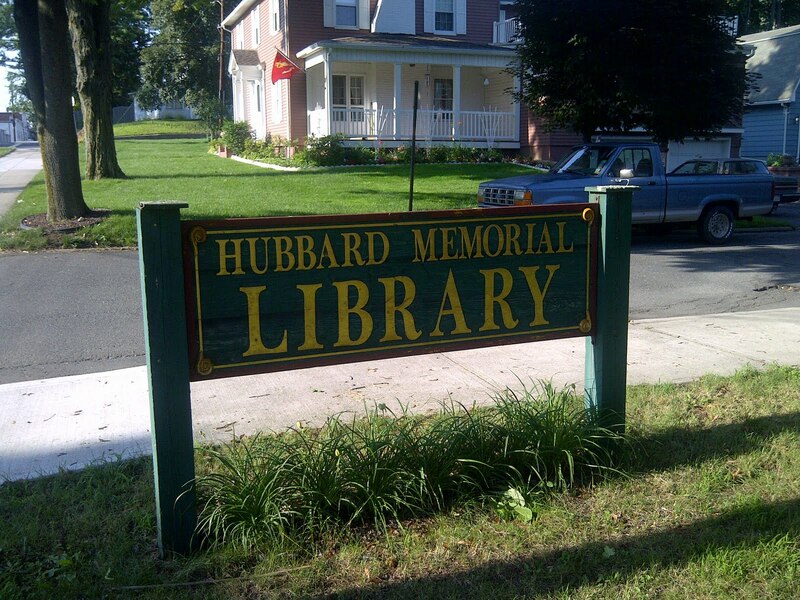 Last week I had a chance to visit the Hubbard Memorial Library and take a few photos. It really was a beautiful day for some photography. Unfortunately, I forgot to charge my digital camera for the trip and was forced to use my phone's camera. I must I am not terribly happy with it. Still though I was able to take a few photos of the building. 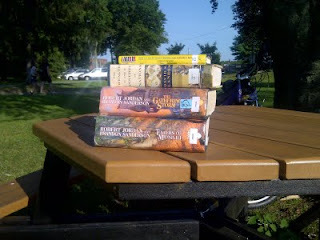 Nice little reading area outside when it is not camped by pre-teen girls. I really love this building. 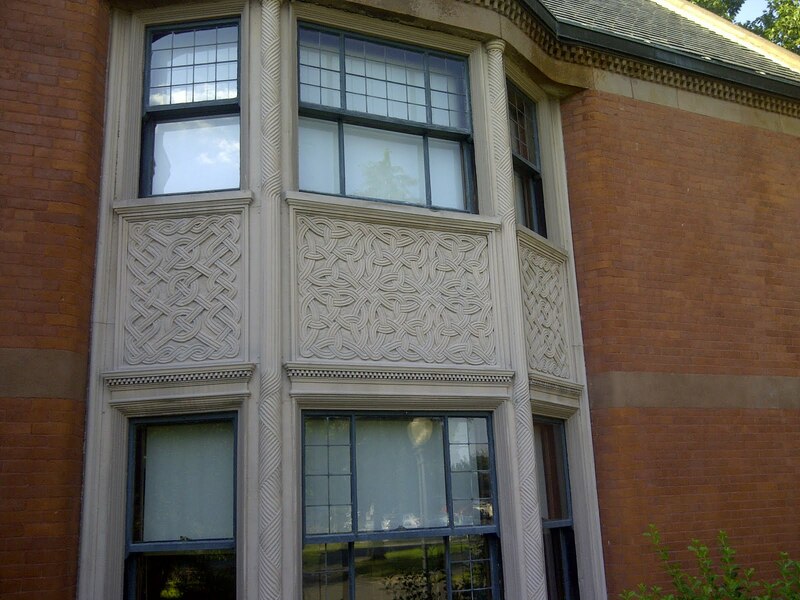 A wonderfully designed brick structure. I particularly like how they incorporate the rotunda. Here is the front entrance. The only drawback to this library is the parking situation. The street here is a small annoying one-way. Cars exiting the parking lot seem to forget or not know this. So you have the inevitable one car entering (correctly) and one car leaving (incorrectly). Beautiful Celtic weave on the facade of the windows. I really have enjoyed my trips here thusfar. It is a good library to be a short drive away from. As many of you tuned into Western Mass already know we were hit with a tornado on June 1st of this year. Springfield being the Acropolis of the West received most of the news attention. However, many other towns across the state were hit pretty hard. The town of Monson was one of the worst hit. 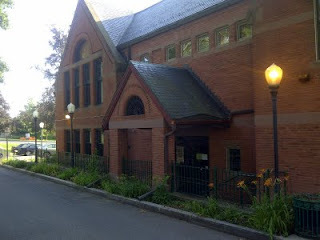 Due to the damage the Monson Free Library was forced to close their doors. Well I am happy to report that in recent days with their needed repairs completed they were given permission to re-open their doors. In the coming weeks I shall have to take a spin up there to take a look. Poor clock tower... I have a rather fond affinity for them.